In the 2018 edition of their Democracy Index, the Economist Intelligence Unit (EIU) recently found that the downward trend of democracy in the world came to a halt for the first time in three years due to an ongoing improvement in the area of political participation. At the same time, however, the study does not indicate any progress at the global scale. Overall, the report’s conclusion represents an aggregate result with significant variations across categories and indicators of democracy, and across regions. The report aims to give a snapshot of democracy worldwide and covers 165 independent states and two territories which represent almost the entire world population. Five categories are used to score each country: electoral process and pluralism, civil liberties, the functioning of government, political participation, and political culture. Based on around 60 indicators each country is placed into one of four types of regime: “full democracy”, “flawed democracy”, “hybrid regime” or “authoritarian regime”. In 2018, 42 countries saw a decline in democratic performance, while 48 registered an improvement. 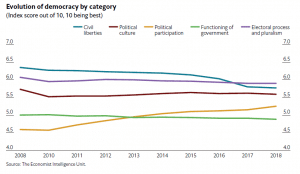 At the same time, the percentage of the world’s population that lives in a democracy dropped from 49.3% in 2017 to 47.7%, less than 10% of whom are citizens of a “full democracy”. According to the report, the overall global Democracy Index score remained stagnant in 2018. With little movement at both the very top and bottom of the ranking (Costa Rica’s advancement to “full democracy”, and Nicaragua’s fall to “authoritarian regime” are notable exceptions), significant change was recorded elsewhere, amongst which the EIU report highlights the persistent “democratic malaise” in Europe (including Italy falling by 12, Turkey by 10, and Russia by 9 ranks) and the resurgence of populism in the wake of Latin America’s big election year. The authors attribute most of the improvements (and absence of decline) to a significant increase of political participation across regions. 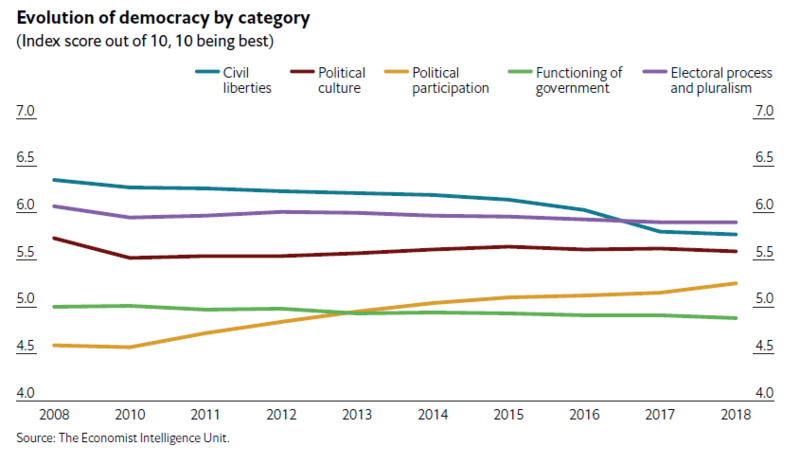 As its steady improvement throughout the past decade distinguishes political participation from the other categories, EIU analysts chose this subject as the focus of their 2018 report. 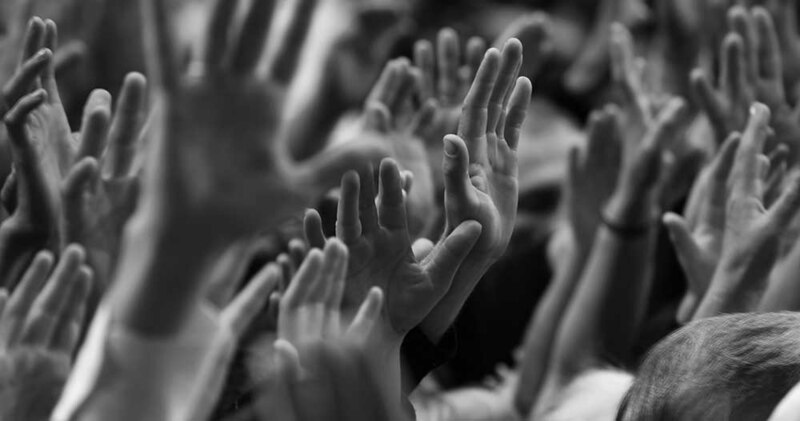 Despite stagnating levels of minority participation, measures of voter turnout, political party membership and adult literacy rose on a global scale, as well as the percentage of the population that declared itself interested in following the news and prepared to participate in lawful demonstrations. The most notable improvement occurred in participation of women in politics, namely, in the representation of women in national parliaments. As the report states optimistically, “formal and informal barriers to women’s political participation, including discriminatory laws and socioeconomic obstacles, are gradually being knocked down”. Though the authors acknowledge that such change has required contentious legislative gender quotas, they commend their undeniable effectiveness. Some positive developments on the measure of women participation occurred even in the absence of a quota. Most notably, the November 2018 midterm elections resulted in a historically high level of women’s representation in US Congress. While the rise of political participation is encouraging, it must be kept in mind that this category of measures stands out because others, including civil liberties and functioning of government, have deteriorated. It is the way in which participation impacts these other factors that will determine what the current trends mean for democracy in the long term. Mobilization in combination with disillusionment, frustration and increasingly polarized societies is not necessarily good news, and, as the authors caution, can be “a volatile mix” and “a recipe for instability and social unrest in 2019”. In sum, 2018 has been a mixed year for democratic performance worldwide. Populism and challenges in the historically most stable democracies continue to constitute major sources of concern, and even the most significant steps forward must be put into perspective. While women representation in US Congress is now at an all-time high, it is still at an arguably low point of 20%. The measure is further limited to legislative representation, failing to consider women’s participation in the, often more powerful, executive branch. All in all, EIU’s 2018 report and the data it is based on give reason to believe that a halt to “democracy recession”, while not achieved, may be in reach. That is, if the recent surge of political participation can be sustained and, critically, used as a muscle for the re-institutionalization of democratic institutions, norms and values. Image: From the cover page of EIU’s 2018 report.